"Running back Ryan Mathews #24 of the Philadelphia Eagles scores a two point conversion over top of defensive tackle Michael Pierce #78 and nose tackle Brandon Williams #98 of the Baltimore Ravens in the second quarter at M&T Bank Stadium on December 18, 2016 in Baltimore, Maryland." I love risk taking and that's always exciting when teams do the same in sports photography. With no chance of making the playoffs, the Philadelphia Eagles took lots of calculated risks as they attempted to close the door on the Baltimore Ravens post season hopes. A cold, windy game the Eagles put lots of pressure on the Ravens as they kept the game close all day on Sunday. Two of those risks came in the form of going for two point conversions. 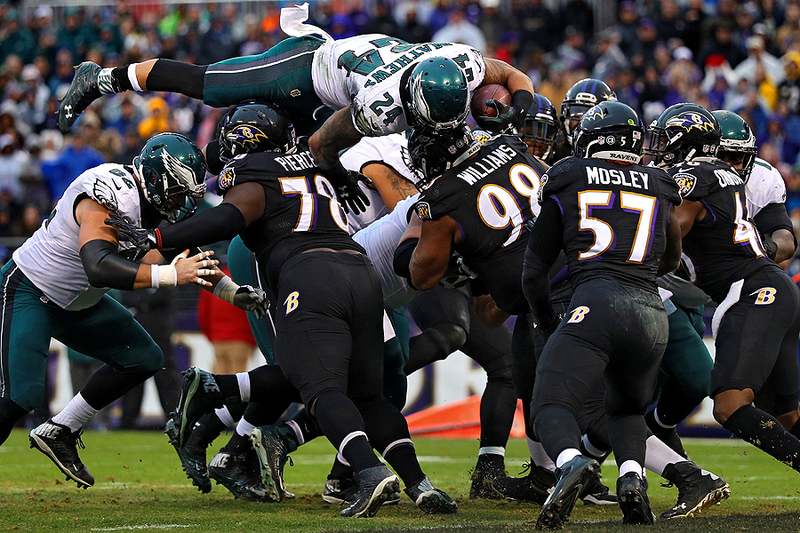 The first resulted in scoring said two points as running back Ryan Mathews took off from the ground and soared over Ravens defenders before landing into the end zone. Unfortunately for the Eagles, they came up short on their second attempt which would have won the game for them late in the fourth quarter.